Columbia’s Josh Fleming is pitching this summer in the minor leagues upon getting drafted by the Tampa Bay Rays last month. The 2014 Columbia High School graduate was selected in the fifth round (139th overall) of the Major League Baseball draft on June 13 following a sensational spring on the mound for Webster University. 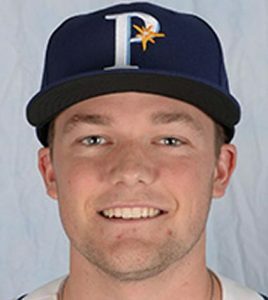 Fleming made his professional debut with Tampa Bay’s rookie affiliate, the Princeton Rays of the Appalachian League, on June 27, throwing two scoreless innings of relief. He allowed no hits and struck out one. So far this summer, Fleming is 1-0 with eight strikeouts and five earned runs allowed in 7.1 innings pitched for Princeton. Fleming, a 6-foot-2 lefthander, posted an 8-1 record with a Division III-leading 0.68 ERA and 115 strikeouts in 92-plus innings during his junior season at Webster. He was named D3baseball.com‘s 2017 Central Region Pitcher of the Year, and was also chosen as Pitcher of the Year in the St. Louis Intercollegiate Athletic Conference. Opponents hit just .169 against Fleming this season. Fleming became the first Webster baseball player to be drafted by a major league team. He went 8-4 with a 1.53 ERA during his senior year at CHS. Josh is the son of Lori and Mark Fleming of Columbia. He has an older brother, Zach, and younger sister, Elizabeth.